We all have these phrases we repeat over and again. Sometimes we don't realize it, but they are there. It's called a Verbal Tic. Just one of those things I guess. Some folks start off a thought with a word. "Well, I've ..." is common. It gives you time to think, gather the rest of your thoughts before you run out of steam and wonder why on Earth you started to speak. I didn't realize I had one until the other day. 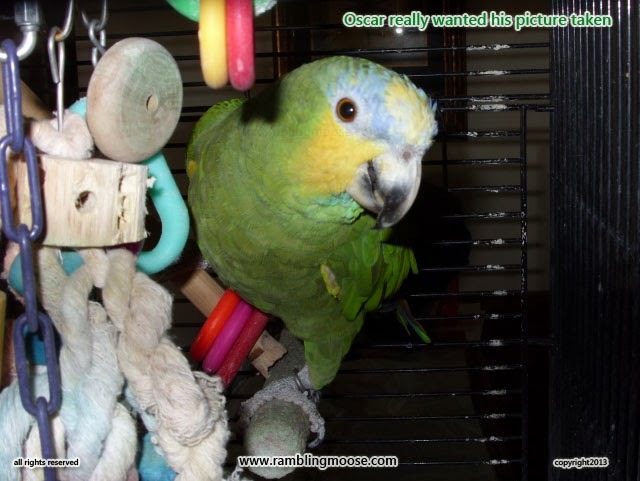 Oscar the Parrot told me that I did by repeating to me what I say. I'm used to making plans and following them out to their completion. Part of being a Project Manager, I guess. You get the plan going and then eventually you have to get started, right? "Here we go." Yep, it's mine. I had been playing some music in the house in the Call To Flock hour. That's when parrots in a flock will call to each other to gather themselves close for either the evening roost or the morning feed. That racket you hear when the feral parrots fly overhead serves a purpose. Other than to give you a headache or annoy you, that chattering and screaming will let the birds in a flock know where the rest are. You see it in a Mall or a large shop when some kid is screaming for its Mom at the top of its lungs. Shaddap both of you. Never mind that, it's happened for centuries and will happen for centuries after this has been read for the last time. My life tends to be rather ordered. Certain things happen at certain times of day. Meals are planned and served. Dogs need to be walked. There are trips out to the store. Gardening to be done. Many of those tasks have to be completed by more than one person, whether furred, feathered, or thin skinned. That last one would be me. Some of the others around me aren't quite so thin skinned, I'm sure. We would go through the ritual of getting things settled and "Here We Go" dinner is ready. "Here We Go" it's time to go to the stores and get a gallon of milk, some flour, frozen cherries, and some Fruit Pectin. Yes, I'm planning on making more Cherry Jelly. It's dead easy to do. What I didn't realize was that telegraphing my intent was so frequent that the chattering that Oscar does now includes "Here We Go" along with "WAAAAAH!" and "Hello!" as well as other partial phrases and so forth. He was barking and flapping and making a general nuisance of myself when I heard it clearly for the first time. Did he just say "Here We Go"? Yes I think he did. I guess I really do repeat it enough. Oscar the parrot has been with me since 1986. He's a bit of a grumpy bird, but I guess he's finally finding himself someone to bond with. I never thought it would be me, but I'm glad it is. Now, if I could just convince him to let me listen to music loud once in a while without his own accompaniment, it might be a little better for me. There's this one Soca song that I want to hear on the speakers that was done to the NFL Football Sound Bed and if I can hear it, the neighborhood will hear "BRaahhhhSSS!" coming out of the house.